This book is unique in that it does not simply discuss an author's practitioner experience or present a summary of academic research on what makes projects succeed. Rather, this book does not hide the real complexity of the issue and does not attempt to introduce the reader to some elusive nonexistent boilerplate solution. The book does include real world experience and does summarize academic research, but it also treats outsourcing for what it is -- an incredibly complex process. 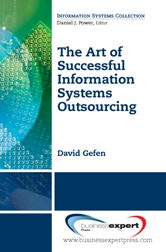 There are however many steps managers can take to understand outsourcing for what it really is and manage this process accordingly. It is this focus on the correct mindset, rather than the methodological steps alone, that makes this book unique, and that is why the title of the book is about outsourcing as an art and philosophy.